Can design thinking programs lead students to perform better in their core academic subjects? Whether you decide to replace design thinking with ‘arts education’ or not, an affirmative answer of ‘yes’ to this question is the holy grail of funders, program directors, and measurement fanatics everywhere. From over 14 years of doing this type of work, I can tell you anecdotally that this is absolutely true and share many stories about how design gave students the tenacity to relentlessly work to improve their writing, math, etc.. There are numerous examples of students developing a new sense of self worth and empowerment that changes their attitude to school and community. I could also show you such things as before and after writing samples indicating improvement but an attribution of impact directly from a student has eluded me. Imagine my surprise when assembling an exhibit of student work from iamadesignleader! that I stumbled across the forgotten photograph pictured above that I had taken in haste a month and a half earlier as we wrapped up class one day. iamadesignleader! is a youth community design leadership program at M.S. 118, a public middle school in the Bronx, funded by the National Endowment For The Arts that we created for our clients, DreamYard and openhousenewyork. This is a photograph, of a quick reflective/evaluative writing piece by our 7th graders about the impact that the program has had on their learning. Looking at this photo still makes me grin a mile wide and is quite frankly, a funder’s dream. 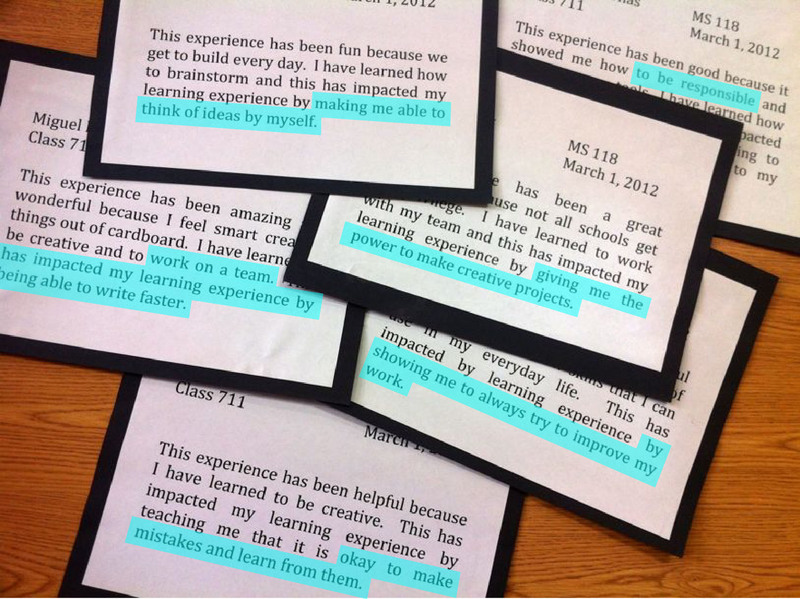 In short, our community design leadership program has helped students become more comfortable with and able to learn from failure; made them more creative; forced them to be more resilient and tenacious; made them better citizens; taught them how to work in teams; and yes, enabled them to write faster (and better according to their teacher). We constantly use reflection and reflective tools that we have developed ,such as the one shown below, to get great things out of kids, measure progress, and market/help students describe their work to outsiders. Everyday, we strive to achieve this double or triple bottom line in a class or our work in general. Be that as it may, we had nothing to do with the writing assignment that produced these insights, this was 100% Ms. Leon, our 7th graders’ English teacher. To be clear, these were just a few of the responses and our community design leadership program only took place one a week! Just 90 minutes of design thinking, one day a week can improve student achievement. We did work relentlessly to weave writing activities into our design activities (actually, a critical part of all of our design-thinking programs). Similarly, Ms. Leon seized all opportunities to weave design into her lessons, mostly through the angle of using the design process to reinforce the writing process (creative or otherwise). Our community design leadership program also perfectly plugged into the community focused curricular guidelines for 7th graders in New York. If this can happen in a public middle school, way up in a tough part of the Bronx, why can’t it happen everywhere? Want to see more of the students’ work and the iamadesignleader! program? Visit the website we created for the project by clicking here.